Trampolines have evolved to become some of the most popular training equipment for families, gymnasts, and other training enthusiasts. Having one at home can help your family to exercise and play in an excellent and healthy way. This piece of equipment helps gymnasts to perfect their new tricks and work on their new moves. If you are planning to get yourself a trampoline, it is essential to know what kinds are available in the market. Here are five trampolines you and your family will love. This is an excellent trampoline for children. Its portability makes it ideal for all outdoor activities. It is easy to install and has handles and padded frame covers for enhanced safety. The Acon Air also has a premium product of its kind – the Acon Air 4.3 Trampoline. This equipment is built so marvelously that you can use it for all your gymnastic or fun activities. Additionally, this trampoline comes with instructions and a spring tool to make installation easier. Also, the five-year warranty on the frame and the mat are an assurance of its sturdiness and durability. This equipment can be left outside for long due to its heavy duty material. Just by looking at the Vuly Thunder, you begin to understand that it is something out of the ordinary. This Trampoline is a product of Australia, and contains quality features that will impress you over and over. The material used in constructing the Vuly Thunder is water resistant. Due to its sturdiness, this trampoline can be left outside all year round. If you are looking for something durable, the Vuly Thunder should be top of your list. This round trampoline is ideal for families that don’t have adequate space but still need to enjoy the excitement and fun that is linked to this equipment. 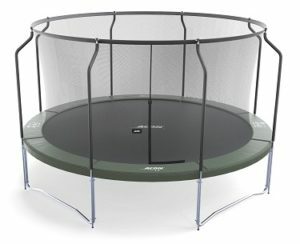 Compared to other trampolines, the ten-foot Skywalker does not take up so much space and still offers a great bounce. This equipment is not so heavy since it weighs about 175 pounds, making it suitable for the imagination of your kids. 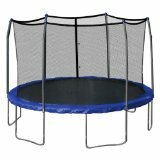 Its ten-foot diameter, plus the added rim, makes it safe for bouncing. If you are planning to buy a trampoline, there are different kinds you need to know about. Read the online reviews so you can determine which trampolines are ideal for your kids. You can also consider one of the options listed in this guide. It is very important to remember Grandma at the holidays and on their birthday. As your very own parent, you’ll be buying your own personal gift for them, but this is an excellent opportunity to teach children about giving. Encourage them to pick out something special for their grandparent, but help guide them towards items that will be as special to Grandma as it is to them. Homemade gifts are special treasures. Best of all, your child will be given an opportunity to be creative as well as learn the importance of giving to others. Choose age appropriate crafts that you can enjoy together. This could be as simple as having them color a picture. Buying a frame to put it in will make a cute presentation for Grandma, and your little one will feel like their artwork is amazing. Gifts don’t have to be material items. Offering time spent together helping Grandma with household chores is always a wonderful idea. This could be time spent with Grandma in her garden, baking in the kitchen, or helping clean-up around the house. Your mother will love making memories with her grandchild, and your little one will be learning to put others first. Even the littlest of people enjoy a day of shopping. Make it an adventure by helping them find that perfect gift for Grandma. Look for items that are acceptable for adults but have a touch of childish whimsy. A good example of this would be the colorful Jim Shore figurines from Hallmark. You could also have them pick out a picture frame that they can fill with a photo of themselves, or help them find a nice box of chocolates or other sweet treats. Once the perfect gift is found, you have another teaching moment. Help them wrap their gift to Grandma, and explain how important it is to always express your love in words, actions, and small tokens of appreciation. Do you have a timeshare contract that you don’t need or want? Many people find themselves in this situation. So if you are wondering, “how do I get rid of my timeshare,” then you have come to the right place. The following are some useful tips to help you do exactly that. This is the first option that a majority of timeshare owners have available to them. It can be hard to sell timeshares in the resale market. The best way to try to do this is to attempt to sell your timeshare at a fairly low price at a time of high demand. You might also want to consider listing your timeshare on Craigslist, eBay, and other classified websites. This is another way to help reduce your expenses. One challenge is that timeshare resorts often rent out their unoccupied timeshare units at lower prices than it costs to own one. That makes it hard for timeshare owners to rent theirs out. However, it still can be a way to help reduce expenses of owning a timeshare. If you come to the conclusion that you are not going to make a profit from either renting out or selling your timeshare, you may want to donate it to a charitable organization. Many timeshare owners recently have started paying someone to take their timeshare over and relieve them of their obligation. The practice is commonly referred to as timeshare relief. This way, the owner can at least get rid of the obligation of having to pay for any timeshare related charges such as maintenance fees. This is technically one of the more viable options to get rid of your timeshare contract. The tricky part here is there is a stipulation in some timeshare contract that the resort isn’t obligated to take your timeshare back. So if you are thinking about buying a timeshare, make sure the contract provides a way to exit the contract. To conclude, buying a timeshare gives you a way to own part of a vacation property that can be used, usually one per year. Frequently buying a timeshare is an impulsive and emotional decision. It is only recommended that you buy a timeshare when all other vacation rental services and property ownership options have been explored first. If you own one already, one of the above strategies can be used if you ever need to get out of your contract. Is it OK to Dress Your Kids Up in Sports Apparel? Are you a major sports fan? Maybe it’s more your husband’s thing. But do either of you ever wonder if it’s ok to dress your kids up in Steelers apparel or other fan jerseys? If you’re feeling guilty about buying a little jersey for your tyke, maybe you need to examine your own reasons as to why this may be the case. Even if it’s more your husband that is the motivating factor behind giving your little one a sports makeover, it may not quite sit right with you. But is there really a reason to feel any sort of panic over an admittedly less than hot button issue? Could it Be a Control Issue that Concerns Either of You? Perhaps one of the first things you may care to examine concerns your own relationship with your spouse rather than your feelings for your little one. This, of course, is the issue of control. Babies, naturally, are too young to be motivated by feelings of this sort. They will usually be very happy to wear whatever you choose to present them in. If they get it quickly muddied up, it’s just a byproduct of having tiny hands that are less than ideal for grasping the concept of table manners. But meanwhile, you and your husband may differ on just how to dress them. Do You Care if Your Little One Wears a Cute Tiny Sports Jersey? The main issue to consider here is the image you and your little one are projecting. Does it cause you any major concern if your husband enjoys showing off his little one in the jersey of his own favorite sports team? Is it a different team than the one that you prefer to show your personal support for? Or is it a matter of you being different from your husband in that sports of any kind don’t really interest you all that much. If so, it may just be irritating to you to see your little one dressed up in the colors of a team that you really care very little about. The truth of the matter may be difficult to accept at first. However, it may just be that you need to realize that your husband isn’t really setting a bad example by giving your child a sports makeover. In fact, he’s most likely not setting any kind of example at all. Babies are usually not terribly choosy in what they wear, since all of their wardrobe comes from your paycheck, not theirs. The most that can happen is that they look back at some baby pictures of them wearing a sports jersey and get a good laugh or groan from it. It’s really more Dad’s thing than theirs. If, in the end, you decide that you are really ok with your baby sporting a football jersey, you can certainly find plenty of them on the world wide web. Sports teams of all types are tapping into the infant wear market with a gusto. You can easily find the right jersey to help support your favorite team. You might not know that you can lose a significant portion of your body heat just through your head. Each time that you step outside on a cold day, you’ll find yourself shivering and shaking. Babies have an even harder time regulating their body temperatures, which is why you need to find the right hat for them. That hat will keep your child from feeling cold and can protect him or her from the environment too. Whether you had children in the past or this is your first kid, you may still need some tips on how to pick the best beanies for babies. Size is not nearly as important as you might think because most manufacturers sell products for babies with a large size range. Instead of buying a specific size like you might do when buying clothing for yourself, you can pick a hat designed to fit kids of a certain age. Most of the beanies that you see will fit a newborn baby or a baby up to 12 months old. Beanies use flexible materials that have more stretch and will expand to fit your baby’s head as he or she grows. Material is more important than size, and when you shop for hats, you’ll find that many cheaper hats use cheap materials that can cause some discomfort. How would you feel if someone made you wear a wool hat that constantly scratched and scrapped against your head? Cotton is one of the top materials that you can choose because it will feel soft and smooth against your baby’s head. Look for materials that are breathable and those that you can wash easily too. Some parents focus their search on hats made from organic materials. Making your child wear any piece of clothing that feels uncomfortable is like setting yourself up for failure. Have you ever put your baby in something that was too tight? You probably noticed that your child cried and cried until you removed that article of clothing. One of the most important things to look for is any type of tag. Some beanies have a tag inside that can rub and scratch against your child’s head when laying down. Check the interior of the hat for any scratchy or rough materials too. No matter how cute the hat is, comfort is always key. Consider the overall design of the hat too. Some companies make designs that resemble adorable little animals like cats and bunnies. Others make fun beanies that incorporate sports teams and superheroes like Batman. You’ll want to make sure that the design is appropriate for your child and for the activities that you do with your baby. A hat with long ears or decorations that hang down may get in the way when changing diapers or putting your child in a car seat. The design should be as unobtrusive as possible. Buying clothing for a baby as a new parent can be a little confusing and frustrating too. You might find yourself drawn towards clothing that looks cute but isn’t very practical, which is especially true of hats like beanies. Make sure that you find hats for your child with a fun design in the right size and made from a good material with a comfortable fit.